Circulation tasks—checking out, checking in, holds, transits, etc.—are handled in a few places in Library. This article covers the different sections of Populi and how to use them to complete some common workflows. When you check out resources, you are loaning them to a patron; the resources are leaving your library system. Go to the Check Out view. Click the gray ...scan... bar to put the Check Out view in scanning mode. Use your barcode scanner to scan the barcode on the patron's Populi-generated ID card, and then scan the barcodes on the resources he's checking out. All things considered, this is the more accurate method: you can only scan items that are physically present! Use the respective search fields to find the patron and resources. All things considered, there's more opportunity for mistakes with this method: you might select the wrong items or patron! Review any resource warnings that come up (unavailable, etc.) and click Remove to take those resources off the list. You cannot complete the checkout until such resources have been removed! When you're ready, click Complete Checkout. If the patron wants a receipt, you'll see a link to print one after you complete the checkout. When you check in resources, you are recording that they have arrived at your current library. Use Check in to record when a patron returns loaned resources or a resource arrives from another library (whether because of an inter-library loan or a change of home location). Select the library at which these resources are being checked in. Don't forget to do this! Scan the resources you're checking in. Again, this is the most accurate method—you can only scan what's physically-present! If need be, you can also use the search to find the resources you're checking in. If needed, you can leave notes on the checked-in resources. Review the action items—you might need to reshelve the item, send it to another library, or prepare it for a patron who has placed a hold on it. 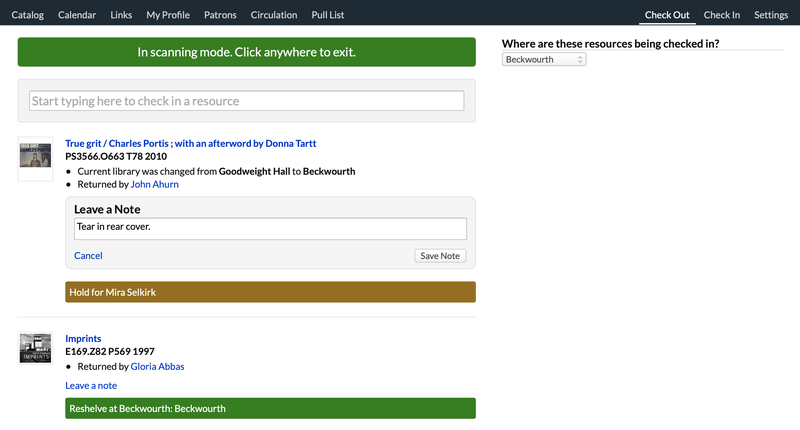 Here's how to handle the movement of resources amongst your libraries. 1. Start at the Pull List: Transits (including inter-library loans) begin at the Pull List. When a patron places a hold on a copy or library staff changes the home location of a copy, it goes to the Pull List. Select a library from the drop-down. Scan the resources you've pulled or check the box next to the call number. This changes the copy's status to Awaiting Transit. 2. Go to Circulation > Transits: As you scan Resources from the Pull List, they move over to the Transits report in Circulation. Use the drop-downs to see copies that are scheduled to depart or arrive at a particular library location. When you're ready to send them out the door, scan the departing copies (or click mark departed). You'll see these when you select Currently in transit (as well as Scheduled to arrive at). 3. Check in arriving resources at the destination library: As soon as they're checked in, they're available for checkout (loan policies permitting) from this library by your patrons. The Circulation view includes a group of reports and tools which help you keep an eye on your resources and make sure they're where they need to be. Active Loans: Shows all resources currently checked out to patrons. Transits: Shows resources awaiting transit or in transit. Holds: Shows resources placed on hold. Select from the three hold statuses and any Library locations to see what's going on at each Library. Cancel a hold by clicking . Expired Holds: Shows the expired and cancelled holds at each Library. Scan them as you reshelve them to make them available to your patrons. Reporting: A number of circulation-related reports from different perspectives. Enter start and end dates in the time period, then select how you'd like to see the information display (By loan, By patron, etc.). Click Export XLS to create a spreadsheet of the report.